RANDOM: SAUTS ALASTOR "Infernvs Daemonvm"
"The Grand Executor", back in the year 2000, was and still is one of the best well hidden secrets of the Malaysian scene. Without much fanfare going on, it will always be regarded as one of the better black Metal releases for those who are fortunate enough to obtain it. 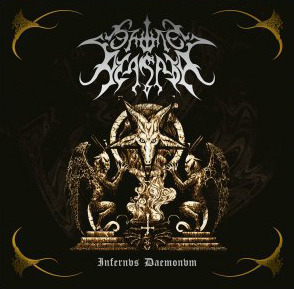 Fast forward to 2012 and after some rather promising 'comeback' live shows, SAUTS ALASTOR is officially on their unending quest once again, duly stamped by the release of "Infernvs Daemonvm". As a single, the song with the said song title initiate the foreplay, yet the band (and probably the label) are generous enough to slot in some live tracks to make up for the duration. "Infernvs Daemonvm", as grandiloquent as the title sounds, is an opus of slightly more than eight minutes with epic proportions. It shows that SAUTS ALASTOR are never losing it, in fact they return with adequate warchest to march on. It doesn't that hard to earmark the influences of their music, SAUTS ALASTOR undeniably took the best out of the Scandinavian black Metal scene and the forwardness of late EMPEROR to carve their own. "Infernvs Daemonvm" will reminds you of DARK FUNERAL, SETHERIAL, and of course EMPEROR in the mix, yet before you even thought that you could get nothing else there's always this untradeable abilities of song-craftmanship that SAUTS ALASTOR possess that will make you stay for more. That compositional edges that you might not get from countless practices of the instruments alone. That midas touch, so to say. The seamless foray between the parts and instruments conjures the everchanging landscape of the song with ease and unescapable dark charm. As for the live tracks included, they're as good as a raw live recordings could get, audible enough for a chance to hear their own rendition of EMPEROR's 'I Am The Black Wizard', DISSECTION's 'Night's Blood' and another original track 'Black Chaos Night'. SAUTS ALASTOR is back. And it is a BOLD STATEMENT.